Looks like Boring Company received permission from the Hawthorne city council to go ahead with their test tunnel under city streets. They will still need to pull permits but that's technical and not political stuff. Earlier this month, Elon Musk’s Boring Company presented the second phase of its tunnel at a special meeting of the Hawthorne city council. We now learn that they have approved the plan and the startup can start extending its tunnel. As we previously reported, the second phase would link the tunnel entrance and 160-ft first phase of the tunnel under SpaceX’s parking lot to a new 2- mile (3.2 km) long tunnel under 120th street all the way to Hawthorne Boulevard. They will dig the tunnel at a depth of 44 feet and said not to expect to see any construction or disturbance at the ground level. The company will use its first boring machine (Godot), which they want to improve on during the making of this tunnel. He explained that Boring Company will use Tesla’s technology for its transportation system in the tunnel – a sort of electric skate platform to transport cars autonomously in the tunnel. While it’s still only in development, the ultimate goal of the project is to create an entire network of tunnels under LA to alleviate the traffic. They plan for drivers to pull up on those platforms and be transported at higher speeds than on surface roads. Musk hopes that after the test tunnel, they will connect with LAX to dig up to Culver City, Santa Monica, Westwood and Sherman Oaks. He is reportedly working with the Mayor of Los Angeles on the project. In other projects for longer distances, the Boring Company is actually thinking about creating a vacuum in the tunnels to turn them into a hyperloop system. Musk says that the company is already working on one between New York and Washington DC. SpaceX is going to be holding its second hyperloop pod competition this weekend at their test track near their headquarters. The better plan, IMHO, is to have drivers pull up to parking lots (or arrive in their robotaxi) and travel down to a superfast, 100+ MPH, 'express' subway car that takes them to their destination without stops along the way. Then get into a robotaxi at the other end if they need to travel 'off foot'. Moving personal cars into crowded areas where parking is already a problem makes less sense. Even if they get there quickly. I guess if Boring drills car tunnels they can be converted to mass transit later. Let rich people pay for the first set of tunnels and the early part of the learning curve. That's what the little pods are for -- just a more user-friendly size than a big subway car. (Also bicycle-friendly, to judge by the picture.) Smaller passenger groups mean (most?) everyone gets to their destination without intervening stops. Too few. Let's see a system that moves a lot of people in a hurry. Fire off a pod every minute with each holding 30 or more people during rush hours. 30 people 2x per minute for 30 minutes would get 1,800 people to work in a half hour. A few tunnels, carefully located could take thousands of cars off roads. I doubt you could find 30 or more people all going to the same destination from the same entryway within a minute. Another benefit of van-size pods is: the tunnel entryway can be as small as a parking space or two, as shown in the video. They don't need a big subway station. Might want to ride some subways in a large city. Watch how many people get off in the financial district stop, for example. Here's how a LA Downtown system might look. Imagine an underground station with 10 platforms. With a pod leaving every 30 seconds that's five minutes to load a pod. Subway trains do not stop that long and riders often have to push their way off and on crowded cars. Each platform could have an elevator that held a full pod of people. Take a load down just before the pod arrives so that they are lined up ready to go. (Four across seating loading from one side? Use guide ropes to get people all lined up. A pod pulls in, opens and lets people out. Then pulls forward one length to load those waiting on the platform. The people who arrived ride the elevator up and get swapped out for the next load. That would be a huge station, indeed! All carved out beneath center city Los Angeles? It would be a massive project, and with structural concerns much more extensive than a 14-foot diameter tunnel would have. Maybe someday! But Musk’s paper recommends longer routes, hundreds of miles, for the hyperloop in California. However…. 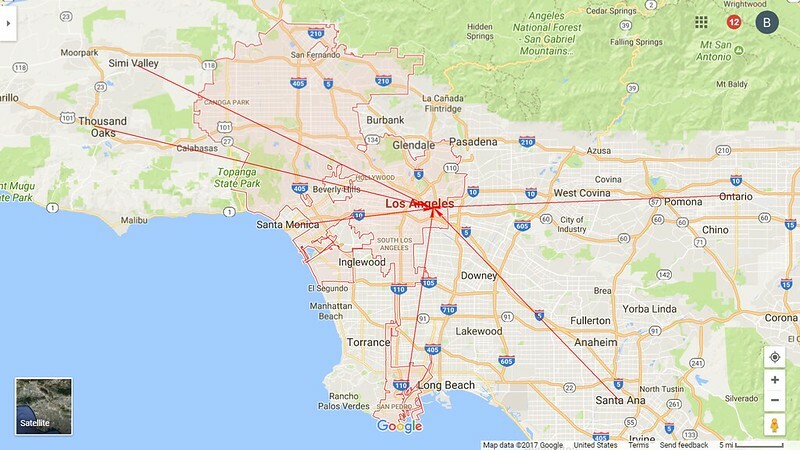 Central LA, to Simi Valley is only 35 miles; to Long Beach, only 20 miles. At the projected 125 mph, Musk’s “skate” idea would take only a few minutes longer than a full-on hyperloop. Plus, the small “skate” entrances and exits mean there could be multiple downtown destinations, instead of one giant hyperloop station in the middle of the city. You’d enter or exit the system closer to your origin/destination, with less need for street transportation. The goal is to take cars off downtown streets, as well as unclogging the highways — particularly at the end of the day, when everyone leaves the office at about the same time. Scheduling your trip via an app would allow computers to assign you (and fellow travelers to your destination) a little pod which will arrive at a particular entryway at a particular time, making most efficient use of the system. I'm not suggesting an evacuated tunnel/tube for commuter pods. One hundred twenty-five miles an hour (sled speeds) would be fast enough, especially with 'express' pods that did not stop along the route. Large station? Maybe the size of a normal subway station in terms of total square feet. Pods stopping and loading side by side rather than a large number of subway cars stopping one behind the other. Getting cars off the streets means getting fewer cars on the streets. Moving a modest number of cars quickly downtown would help some with commute traffic but do nothing about downtown congestion/parking. Small capacity sled-cars won't move a lot of people. I bet if you could travel from Central LA, to Simi Valley (35 miles) or Long Beach (20 miles) at 125 miles an hour we'd have a large number of people who would have no problems with using a 'standing only' pod. 35 miles would take 17 minutes (plus a little acceleration/deceleration time. A pod that carried 30 seated people could carry a lot more standing. Comfortably fill, don't pack. Run a mix of seat and stand pods. Charge less for the stand pods with seat pod discounts for those who need to sit. In general, it's safer below ground, in a well constructed tunnel, than above ground in an earthquake. An 8.0 and all bets are off. Can I ask for a source on the 8.0 figure? I remember the 6.7 Northridge quake tearing waterpipes, gas lines, & sewer pipes apart - as well as breaking concrete block walls, freeways & any manner of structures. With 6 quakes of this magnitude striking California since 1987,(the last 30 years), it seems the odds of experiencing this level quake is fairly high. When the ground is seismically active, I'd prefer to be on top of it. "When the ground is seismically active, I'd prefer to be on top of it." Above ground, you have "stationary" buildings and infrastructure being ripped apart by movement of the earth on which it sits. Below ground, you are moving with the earth, so shearing forces are minimized. Also, electric signals move much faster than earthquake waves. Any detection of significant seismic movement can trip alarms that shut down the entire system. Japan is more seismically active than California, but its bullet train has an incredible safety record. In the 1989 Loma Prieta (San Francisco) 6.9 earthquake a length of elevated highway fell. Well over 100 buildings were destroyed. A 76-by-50-foot (23 m × 15 m) section of the upper deck of the Bay Bridge fell onto the deck below The bridge was out of service for a month. Sixty-three people were killed and almost 4,000 injured. BART (underground light rail) suffered only a small amount of cosmetic damage at one station. The system was shut down for six hours while inspections were carried out and full service was restored within 12 hours. One train was in the Transbay tunnel during the quake and the operator detected no motion. The LA Metro subway went into service in 1993 and experienced the 6.7 Northridge earthquake in 1994. The subway suffered no damage and has not been damaged in the many smaller earthquakes that have happened since. In the Northridge quake 57 people on the surface died and about 9,000 were injured. 125,000 people were made temporarily homeless. Seven major freeway bridges in the area collapsed, and 212 were damaged, disrupting traffic in the Ventura-Los Angeles region for weeks following the earthquake. Communication, water and power distribution systems were affected and several fires started. 82,000 residential and commercial units and 5,400 mobile homes were damaged or destroyed. USA hasn't suffered an 8, (or only 317? years ago when modern infrastructure didn't exist). But is this a good reason for saying all bets are off? Perhaps there isn't any subway or other tunnels anywhere that have been subjected to an 8? Tokyo has an extensive subway that was hit by at least a magnitude 8 earthquake. The images of Japan in the aftermath of the giant earthquake and its terrifying tsunami last week and the consequent failure of its nuclear power plant reactors at Fukushima show the scale of the disaster that the people of Japan have to face and overcome. Amid all the mayhem, the news reporting and images are of what can be seen and witnessed on the surface, but what of the underground? Japan has an underground environment to mirror its vast development on the surface. The fact that there is no news about Japan's underground infrastructure must mean there is no news - or that the report is so minor as to pale to insignificance compared to the reality of the situation on the surface. In reaching out to our friends and readers in Japan after the catastrophic events of last week, TunnelTalk has learned that while "most of the train and subway in Tokyo stopped in last midnight [but] almost all of the trains and subways are [now] running [again]." "A 16-foot-high tunnel running underneath the airport's runways [in Sendai, the city most affected by the tsunami] for about 500 yards was entirely flooded." "As on so many previous occasions, the reality of the aftermath of strong earthquakes is that the underground remains remarkably intact when the surface has suffered devastating destruction. Earthquakes in Mexico City; in Kobe Japan; in Chengdu, China; in San Francisco, California; in Santiago, Chile; all had no headline news of underground or tunnel collapses or failures. For cities in seismically active zones, and for urban development in general, this has to be one of the abiding inherent advantages of underground facilities over surface or elevated alternatives. Of course there it is acknowledged that the underground environment would have been equally as horrifyingly impacted to the consequences of the tsunami as the surface." According to this map Sendai was in the high 8/ low 9 shake zone. And Sendai has a subway system. 2011 9.1 quake was something like 220 miles away. Not sure how much the strength decays with distance though. A study published earlier this year concluded that the land on either side of the San Andreas fault has been pushing against the other at a rate of more than 1 inch per year since 1857. “So you expect that amount of accumulation of energy will be released in the future in a large-magnitude rupture, somewhere along the San Andreas,” said USGS research geologist and study lead author Kate Scharer. The last major earthquake near Los Angeles hit Fort Tejon in 1857 and registered a 7.9. An 8.2 earthquake would produce far more energy than what was produced by the nuclear bomb dropped on Hiroshima. But a bigger issue is that all of Southern California would be hit at once. The map I linked puts Tokyo in the 8 range for the 2011 quake. That doesn't tell us anything about the surface vs subsurface movement. The idea that tunnels move with the earth while the earth moves underneath buildings and bridges is interesting. Given the lack of movement-caused tunnel damage (flooding doesn't count) in several major earthquakes it looks like this is possible. Does power cut causing stuck in train problem count as an issue. Obviously could make lots more categories and above might not be right order. More people in 7 and 8 than in all other categories combined so a switch to 4th best place might be sensible? In general that would be a no fatality/no injury event. Many/most tunnels already have emergency lighting so that people can walk out if the system isn't going to come back to life in a reasonable amount of time. Some rescue system (battery powered powered cars to haul in water/food and move a few people out at a time) could be added if there's a need. You've convinced me that tunnels will survive strong earthquakes, and much appreciation for all the data and logic. I canceled my earthquake insurance on my California home decades ago on the advice of an acquaintance who did risk assessment work for the air force. He believed that quake insurance with it's high costs and high co-pay was ridiculous for single story frame buildings. I haven't regretted the decision to this day. This conversation has drifted quite far. It started with the question of whether underground tunnels are more susceptible to quakes than above ground alternatives. Now it seems like we are questioning whether they take any damage in the most massive quakes. This is silly. Taking some damage or possibly being affected by power outages still means tunnels are in a much better position compared to above ground facilities. Here are some relevant passages from Musk's original Hyperloop paper. Note: he intends the Hyperloop to be powered by solar power and on-board batteries, not the grid. Energy storage allows this linear accelerator to only draw its average power of 8,000 hp (6 MW) (rather than the peak power of 74,000 hp or 55 MW) from its solar array. Building the energy storage element out of the same lithium ion cells available in the Tesla Model S is economical. A battery array with enough power capability to provide the worst-case smoothing power has a lot of energy – launching 1 capsule only uses 0.5% of the total energy – so degradation due to cycling is not an issue. With proper construction and controls, the battery could be directly connected to the HVDC bus, eliminating the need for an additional DC/DC converter to connect it to the propulsion system. The vast majority of the Hyperloop travel distance is spent coasting and so the capsule does not require continuous power to travel. The capsule life support systems will be powered by two or more redundant lithium ion battery packs making it unaffected by a power outage. In the event of a power outage occurring after a capsule had been launched, all linear accelerators would be equipped with enough energy storage to bring all capsules currently in the Hyperloop tube safely to a stop at their destination. In addition, linear accelerators using the same storage would complete the acceleration of all capsules currently in the tube. For additional redundancy, all Hyperloop capsules would be fitted with a mechanical braking system to bring capsules safely to a stop. In summary, all journeys would be completed as expected from the passenger’s perspective. Normal travel schedules would be resumed after power was restored. A capsule becoming stranded in the Hyperloop tube is highly unlikely as the capsule coasts the majority of the distance at high speed and so there is no propulsion required for more than 90% of the journey. If a capsule were somehow to become stranded, capsules ahead would continue their journeys to the destination unaffected. Capsules behind the stranded one would be automatically instructed to deploy their emergency mechanical braking systems. Once all capsules behind the stranded capsule had been safely brought to rest, capsules would drive themselves to safety using small onboard electric motors to power deployed wheels. All capsules would be equipped with a reserve air supply great enough to ensure the safety of all passengers for a worst case scenario event. So if you build an elevator to lower cars into your boring tunnel, there must be a picture. And of course, that car must be a Tesla. Tunnels in Houston? Not just to channel water, but to provide a means of transportation/evacuation other than helicopters and little boats when the city floods. Is it feasible for @boringcompany to dig drainage tunnels under Houston to prevent storms like #Harvey from devastating the area? In this situation the tunnels would flood too. Can't really design for a 1 in 500 year flood. Elon Musk: Tunnels are sealed to 5 atmospheres of water & gas pressure. Just need walls around the apertures. Boring tunnels. Easy as 1-2-3. Second boring machine almost ready. Will be called Line-Storm, after the poem by Frost. "And be my love in the rain." 34 miles, straight line. All in the same state with backing from the governor. 180,000 feet. 60 feet per day with a regular (large diameter) tunneling machine. 3,000 days. 8.2 years. Musk claims that eventually they should reach speeds of 840 feet per day. 214 days. 7 months. Wonder how much faster Boring is now? Smaller diameter will buy them a lot. Of course they could drop in another machine or more in order to get a first line up and running. I'm so lovin' this. With robo taxis on each end of the run there would be almost no reason to drive one's own car between DC and Baltimore. And this could do wonders for Baltimore's economy. Turn it into a DC bedroom community. Maryland's Governor said to 'get ready' for Elon Musk's Hyperloop that will connect Baltimore and Washington D.C.
pretty standard practice to work from both ends of the tunnel. OK, today is 10/21/2017, and the permit for the first 10.3 miles has been issued. When will the section be completed? When will the first Hyperloop be running? My vote: first hyperloop rides in 2022, around the time SpaceX is launching (unmanned) to Mars. But the Elon time conversion may make this 2023. Half radius gives factor 4 volume of earth per day and one from each end makes factor 8. So possibly a year digging time or maybe less. Uncertainty in that figure seems likely to be small compared to time to fit it all out and get a hyperloop operating. Sigmetnow grabbed 2022 which sounds about right - everything new is always 5 years away, so shall I grab 2021 or 2023 or later? I'll go for 2023. Even then, I expect limited capacity which will result in continuing development of 'terminals' for some considerable time before it can operate at anywhere near capacity. I suspect they would be completing the tunnel, building the stations and pods as they were digging the tunnel. From the end of digging to being ready to start testing might not take long. My question is 'only one tunnel'? How about the return route? How about service and escape? Seems like they need three tunnels. Perhaps they would complete one but and use it to test and improve equipment which digging more. I'd like to read a piece on who controls land use at x feet below the surface. What happens if there is a private water well in the route. Because a tunnel is "only" 14 feet wide, it should not be too hard to relocate a well, if needed. Routing under major highways (as the Maryland spokeperson noted was the plan, see Reply #132 above) should prevent most such conflicts. So less than 3 years to dig, just over 4 years after that to start of operations and it wasn't a new transport technology. Maybe when the technology is more mature, it will be simpler and not take 4 years from digging completion. The Chunnel required building a railway in the tunnel. They system that Boring will use (I'm guessing) will be sections of tubing that will get moved into place and welded. Knowing how Musk likes to work I suspect speed will be of the essence. Will be fun to see what timeline Musk lays out in his "proper announcement" in "a month or so." Going to be hard to keep up! Nifty. That's just a few miles from were I live. I doubt, though, that there will be a station stop there on the eventual DC-Balt line. Maybe a stop at BWI airport/train station, not much further away. Much as I'd like to dislike our Republican governor, he does seem to be forward-looking by facilitating this project. ... 500 ft [150 m] so far. Should be 2 miles [3.2 km] long in three or four months and hopefully stretch the whole 405 N-S corridor from LAX to the 101 in a year or so. Highway 101 near the top, LAX airport near the bottom. SpaceX (where the tunneling started) is next to Hawthorne airport. Any wonder that a tunnel sounds like a great idea to a lot of Los Angelinos? They started work on the launch pit in January and installed the TBM in May. That's four months just to get started. Musk tweeted that the first segment of the tunnel was complete on June 29th. There were no details about how long the segment was. If we assume that it's the 350 feet you mention in the quote above, that's a month to go 350 feet, or 12 feet a day. That's about right for a TBM and crew working up to speed on a new tunneling project. In another another article, Boring's representative estimates that it will take 8 months to bore the 2 mile long test tunnel in Hawthorne. 500 ft doesn't seem much given we were talking of possibly 350ft being complete on June 29th then a pause until permissions granted around end of Aug. Does this perhaps refer to the original, test tunnel under SpaceX property? It sounds to me like it might be from earlier on. Also, keep in mind that they are testing out new methods of boring, and shoring, the tunnel -- and that a second, faster TBM "is almost complete." Expect tunneling speed to increase over time! Same tunnel, pretty sure there is only one SpaceX tunnel currently being dug in LA. There is a bend near end of SpaceX property in Hawthorne per map in post 101 of this thread. 350ft is distance to SpaceX boundary. Well, 2 miles in 4 months is 600 feet [180 m] a week. "Aspirationally" (to use Musk's favorite new term).